Have you ever tried on a kimono? With the rustle of the kimono, you can experience this traditional Japanese atmosphere in Asakusa while paying a visit to the Sensoji Temple, the oldest temple in Tokyo which was established in the 7th century. Afterwards, you will have the chance to go to the Hamarikyu Japanese Garden and experience cruising on the Sumida river. This garden has served many purposes over the course of its history such as the feudal lord's residence and duck-hunting grounds. Here, you can have free time to have Japanese tea at the tea house in the garden as an option. Finally, you will visit world famous Tsukiji Fish Market that has 400 stores and eateries with hundreds of different types of seafood. 1. You will be picked up around 9am from your centrally located Tokyo hotel. 2. Then you and your guide will head to the kimono rental shop in Asakusa by subway. 3. 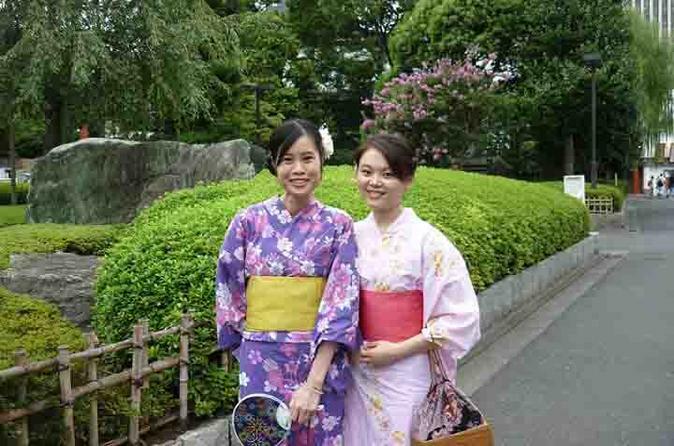 After getting dressed in your kimono, you will stroll around the Asakusa area and visit Sensoji temple, Nakamise street, etc. 4. After your time in Asakusa, you will have the chance to cruise on the Sumida river from Asakusa to Hamarikyu. 5. Once you arrive to the Hamarikyu Gardens, you will have the chance to stroll around and have some free time. 6. Then, when you are done with the Hamarikyu Gardens, you will head to the famous Tsukiji Fish Market (no tuna auction). 7. After your full days tour, you will be dropped back to your hotel in Tokyo around 5pm.